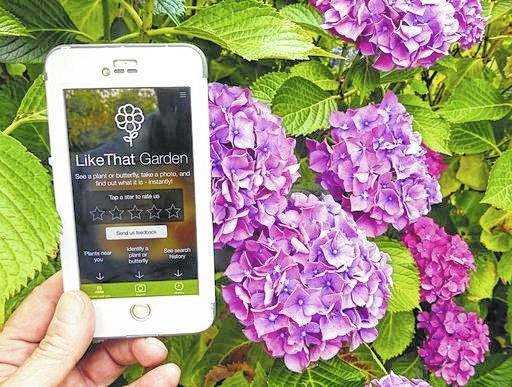 A gardener in Langley, Wash., is shown holding a mobile phone with app called “Like That Garden,” which is one of the many entries in the expanding field of apps designed to instantly identify unknown plants or butterflies from a photo taken by the phone camera. Gardening apps are getting better all the time, supplanting manuals and textbooks as the way people dig for information. Many university Extension services are developing the digital aids to extend outreach to clients. “Extension apps provide reliable, research-based information,” said Christopher Enroth, an Extension educator with the University of Illinois, who evaluates gardening apps for their relevancy, customization and ease of use. “I’ve examined a few apps developed by various companies that are simply another gateway to their products. The word “app” is short for application — software designed for use on smart phones, tablets and other mobile devices. PlantSnap is a recent entry in the expanding field of apps intended to identify unknown plants and flowers. (See also Plantifier, NatureGate, Leafsnap, Like That Garden, PlantNet, ID Weeds.) It instantly identifies plants and weeds from a photo, and along the way is producing what its creators claim is the world’s largest plant database. • For landscaping: iScape, Rain Harvest. • For diagnosis: Garden Compass, Plant Health, My Garden Answers. • For plant guides: GKH Gardening Companion, GardenMinder, GrowIt! • For naturalists: Audubon Bird Guide app, Insect Encyclopedia, Bee Smart Pollinator Gardener. You can contact Dean Fosdick at deanfosdicknetscape.net.